This nail art is dedicated to Taiwan Day, which is 10/10 (I am behind schedule again). I forgot to take picture of what I used in this mani, so just going to name them here. I used Essie Blanc, Nicole by OPI Blue Neon, OPI The Impossible (liquid-sand) and Jenna Hipp Private Getaway. The blue was a challenge for me, because I did not bring any dark blue polishes to Taiwan and I had to use neon polish as a substitute. Neons do not show well without a white base, so that was a lot of work! 2 coats of white base and 2 coats of neon blue. I also used a bit liquid-sand red on my thumb to be a bit glittery. I was inspired by Taiwan national flag, which contains blue, white and red colours, very similar to American flag :) I don't remember, but that white sun and 12 rays have some kind of meaning (yes, very bad of me, didn't pay attention in the elementary social class). My left hand, the sun is not as good the other hand. The middle finger design will be good for celebrating American Day, too! Lots of people asked me about my manicure when I went out. 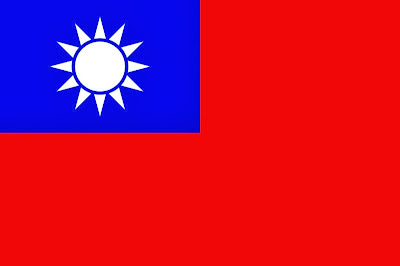 Apparently, not a lot Taiwanese wear their national flag on fingers!? At least I didn't see them :) Anyway, happy birthday to Taiwan!